What do Facebook, LinkedIn, Youtube, Dropbox and Skype have in common? Except for being ridiculously successful, they all enjoyed a strong viral effect that helped accelerate their growth. How did they do that? Here’s the thing; most people assume that these companies grew by pure word of mouth. Well, that’s only half of the story. The other half is that they deliberately built viral features into their products that helped spread the word. product unless other people use it as well. As a result, she shares the product with other people. Sharing is done via sharing mechanisms (e.g: invite your Gmail contacts) or through pure word of mouth. Seeding, which means getting the first people on board is very hard because of Metcalf’s Law (there’s very low value for the first users of the product). However, the growth after the seeding period, usually through word of mouth, can be explosive. This is how Skype came to be what it is. In this type of virality, a person will benefit from using the product individually. However, she can get additional value from collaborating with other people, so she invites them to use the product. A classic example is folder sharing on Dropbox. This works very well if the value from collaborating is high. In this case the product is used to communicate with other people, some of which might be potential users. By “riding” this communication channel (usually email), the product is being spread. If you ever got an email sent with Constant Contact, you probably remember seeing their logo at the bottom. A more pervasive example is the “Sent from my iPhone/iPad” signature at the bottom of every email you send from your iPhone or iPad. Yes, even Apple is using viral tactics (actually, I believe BlackBerry started that with “Sent using BlackBerry”). Offering an incentive to spread the word is a well-known tactic dating back to offline marketing. The incentive will usually be cash or a benefit in return of inviting other people to use the product. For instance, Gilt Group will give you a $25 credit for each person you refer. Dropbox will give extra space to both you and your invitee’s Dropbox accounts, which turned out to work very well. Personally, I’m not a big fan of the cash incentive approach as it is not very scalable but if you can make it work economically, it might be very effective. This method works superbly well for content websites. The ability to take a piece of content and embed it anywhere on the web, with a link back to the original website. This will put your product in front of countless users. There’s an interesting multiplier that occurs when new people who are exposed to the content embed it on their own website, promoting it even further. This approach has worked tremendously well for Youtube and Slideshare. Users that are using your product, either embed one of the features in their own website or refer people to a hosted page to use a specific feature. In both cases, when this feature is displayed to other people, it also includes a “powered by” signature at the bottom, which then becomes a lead generation machine. Survey products are well known for the “hosted survey” approach (SurveyMonkey probably started it). This has also worked well for helpdesk companies such as Uservoice. In this case, companies leverage existing social networks to spread the word about their product. Typically, you sign up for the product with a social network id (say your Facebook id) and then through using the product, you broadcast to your social graph the fact that you are using it. Zynga exploded on Facebook because every time you fed your goat, all your friends knew about it. Spotify’s killer integration with Facebook is another great example of that. There’s much more depth to explore on the specific mechanics of using this tactic, but if you get it right, you’ll experience tremendous growth. You can also add Twitter and Facebook accounts on top of an existing signup and broadcast to both whenever the user performs an action. Instagram does exactly that to get more exposure for the app and it seems to work well for them. Also, I have no idea what are the results of the CutCopy album page but I found their use of this tactic to be super interesting. Pure word of mouth happens when people are spreading the word about the product just because they enjoyed it, it’s free, or they think it’s cool. While this is very hard to quantify, there are two things you can do to support that kind of virality. First, build an awesome product that people really love (Evernote). Second, make it special and give people something to talk about. That’s where branding comes into play. I don’t have their numbers but I can guess that a significant part of Mailchimp’s growth is from people talking about their funny quirkiness. Measuring virality is very interesting. Many people are focused on the “Virality Coefficient” – how many new users on average does one user of your product “infect.” The holy grail is to reach a virality coefficient greater than 1. This usually results in exponential growth. The virality coefficient is super important, but there’s one other critical number that you should pay attention to—the cycle time. The cycle time is the average time it takes from the moment that one of your users performs a viral action to the moment that a new user signs up because of this very action. It makes a huge difference if your cycle time is one day or 60 days. 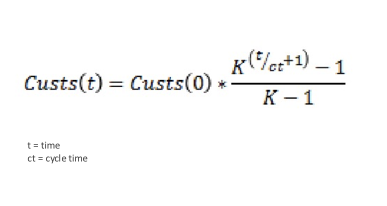 David Skok of Matrix Ventures gave a presentation about that recently, and actually devised a formula to calculate the amount of users you will get after a period of time based on the Virality Coefficient (K) and the Cycle Time (ct). Having virality expressed in this way is beneficial as it boils down virality to the optimization of two variables: maximize K and minimize ct.
It’s really quite simple. Pass it on.